Need to secure assets in block, brick, masonry or concrete? Our exclusive Key-Rex® technology allows us to make the most secure concrete screws in the world. The keyway is exclusive to you, and turns your fastener into a lock, that only you have the key to. They're also available in STYKFIT®7 - a Bryce-exclusive, fast-driving, high-torque, 7-lobe keyway that replaces Tam 6-Lobe™. Whichever keyway you choose, torque is increased 15-20% with the addition of Raptor™ serrations on the underside of the oversized fastener head. Better hold, with no washer required. Add BryKote™ coating for corrosion protection, tested to withstand over 350 hours of intense salt spray. That's 5x what a zinc coating can handle. 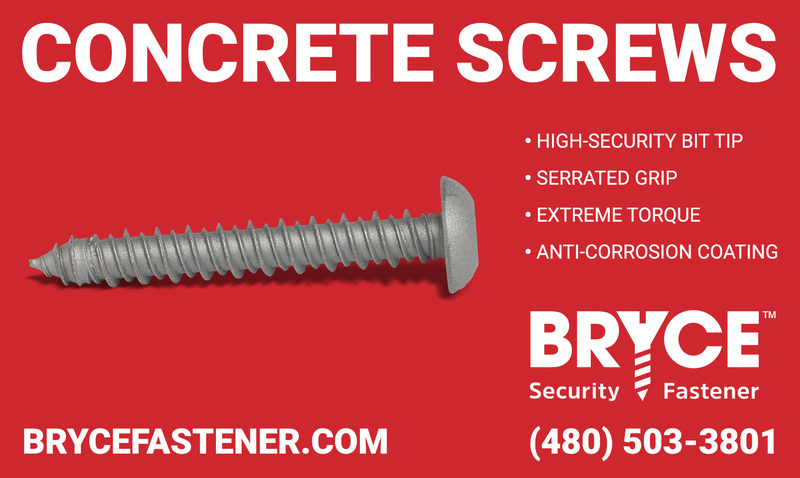 There are simply no better concrete security screws than Bryce.